Nieuwe "Probe-tip style" van ECT. High Volume Testing of Lead free PCBAs. Production proven ECT LFRE plating significantly improves first pass yield. Everett Charles Technologies (ECT) launches the new l40 tip style. The innovative geometry of the l40 tip ensures best yield and reliability and overcomes the challenges of contacting lead free solder or OSP treated copper. Lead free solder an OSP treated copper present a harder or more abrasive contact surface causing excessive plating and probe tip wear. The l40’s advanced off axis tip geometry machining methodology was designed to improve tip wear and resistance to tip fracturing. l40 tip style offers a more robust probe design and a longer tip life. The l40’s straight shaft lance with a 40° facet combines with the penetration capability of a sharp tip probe while providing added material behind the tip to increase strength. l40 tip style is available for probes that meet the toughest challenges in PCBA test and industrial test while providing superior performance and reliability. The development of the l40 tip style combined the thorough understanding of the needs in the PCBA test and industrial test markets with leading in-house design and manufacturing capabilities. 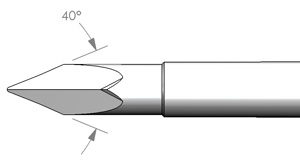 The l40 tip style is featured on ECTs Metrix, LFRE and LFTL probe series. Everett Charles Technologies (ECT) probes with LFRE plating consistently outperform traditional Gold plated probes. In high volume production test applications a three to five percent improvement of first pass yield is typically recognized. Production output is significantly increased by longer probe life and mean time between maintenance (MTBM). Lead free solder, and OSP treated copper pads typically present a harder or more abrasive contact surface causing excessive plating and probe tip wear. Lead free solder can cause multiple problems during circuit testing. Lead free solder typically has a thick layer of flux resin and oxide. This makes reliable electrical contact to the test points a challenge and increases probe tip wear. ECT LFRE plated probes provide customers with a proven high volume production test solution for lead free PCBA test applications. They ensure reliable contact and longer life for probes in in-circuit test fixtures. 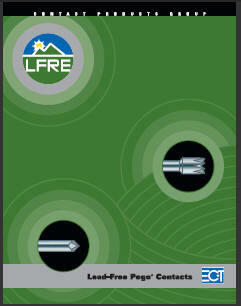 In addition to improved tip ware, LFRE plated probes are less prone to solder transfer. ECT’s LFRE plating has a hardness range of 550 to 650 Knoop, which is about three to four times harder than standard gold. This makes the probe tips more durable and less susceptible to solder and material transfer. Besides the leading expertise in materials and platings, probes for lead free applications leverage ECT’s probe design and fabrication knowledge. The LFRE plated probes incorporate ECT’s proven PogoPlus® bias ball design and double roll close process. Both of which contribute to making sustainable reliable contact to PCB targets.